JUBA, Dec 15 2014 (IPS) – Rambang “Raymond” Tot Deng was 18 and attending his final year of school when fighting erupted in South Sudan’s capital Juba, one year ago. In the ensuing violence, as Raymond’s schoolbooks burned, thousands of South Sudanese were killed, including two of his cousins. It was never meant to be this way. The bells of celebration that rang around South Sudan just two years ago are today emergency sirens. And while South Sudan is a crisis for children and of young people, sparse global attention has been paid to them. This must change. The well of pain runs deep in many parts of Africa, and yet it is young people who offer the best chance for true conflict resolution, and lasting peace. Conflict-affected youth are often the most ambitious, the hardest workers. They want back what was taken from them: opportunity. They want an education and they want to earn a livable wage. 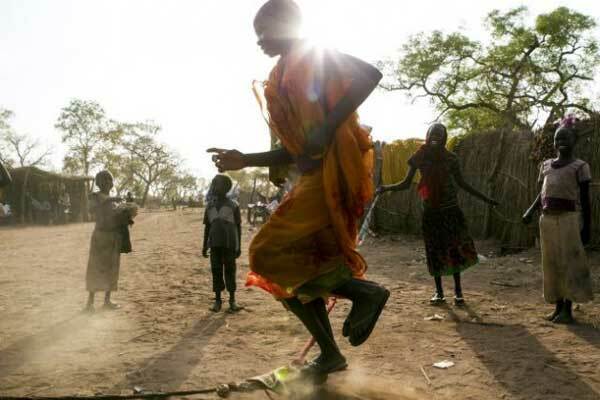 Since conflict began, an estimated 1.8 million South Sudanese have fled their homes. Many remain on the move, while tens of thousands are living in camps in South Sudan, such as the UN Protection of Civilian camp #1 on the outskirts of southern Juba. Raymond’s experience of war, violence and suffering has been shared by hundreds of thousands across the region. But during the past two to three decades, it has consistently been young people who have been most affected by the conflicts that have raged. This early experience of conflict leaves young people in a kind of no man’s land. Education interrupted, opportunities crushed. In South Sudan 400,000 young people have lost the chance to have an education, in this year alone. Hundreds of thousands more are jaded, frustrated and disconnected, putting them at a critical crossroads, do they fight or fight for peace? How then to do this? UNICEF believes one answer is through providing essential services, and in particular, education. Basic education and vocational-skills training can lift people out of poverty by providing opportunity. But an education can be so much more, teaching war-torn children things many of us take for granted. At school children learn about the environment, about sanitation, and the importance of good nutrition. In turn, they become agents of change, conveying good practices to their families. Importantly, children who go to school are less likely to be recruited by armed groups. UNICEF, through Learning for Peace, our Peace building, Education and Advocacy Program, is helping to rebuild and improve schools in both conflict and former conflict zones in South Sudan, providing materials and psychosocial support to help children cope with the traumas they have suffered. UNICEF believes a key strategy for governments, the African Union, IGAD and development agencies is to counter insecurity through harnessing and connecting with youth. On this, Raymond should be a poster child. Despite the horror he experienced a year ago, the boredom of the camp and the frustrations of having his education suspended, he is a born peacemaker. Now part of a youth forum in the Juba camp, he leads discussions on the root causes of conflict and reconciliation.